Its odd how some things just "feel" right. In the case of a set of wargame rules, an emotional response to the product of intellect and logic (however flawed). The oddness no doubt merely reflects an inadequate awareness and analysis of said emotions even when they are acknowledged and considered during design. For example, I have no idea why I find the "one base is a unit" thing so satisfying. I can conjure a dozen logical arguments for or against it but only guess at the real reasons why that attraction exists. One argument for them is that one can make interesting dioramas on each base. One can, and in the past I have done so, my 15mm Indians never really left the woods since every base had at least a bush or rock and fallen log if it didn't have a small tree to hide behind, but even with these plain, temporary bases the satisfaction persists. It might be thought to be ease of moving them about but really one 3 stand unit is no harder to move than three 1 stand units. Reason is denied or rather hidden, I'm sure it exists. But on with the game. An overview of the table as Red marches on. All hills are gentle. The rifle pits are deemed hidden until within rifle range. Units in woods etc are hidden until adjacent. Normally I would use some sort of blinds but I was under the weather and thus tired and just pretended I didn't know where they were and scouted all possible hiding places. Ostensibly Red does not know that the enemy is about to be heavily reinforced. To maintain some level of genuine surprise I rolled each turn for the arrival of reinforcements and didn't choose an arrival point until they did arrive. 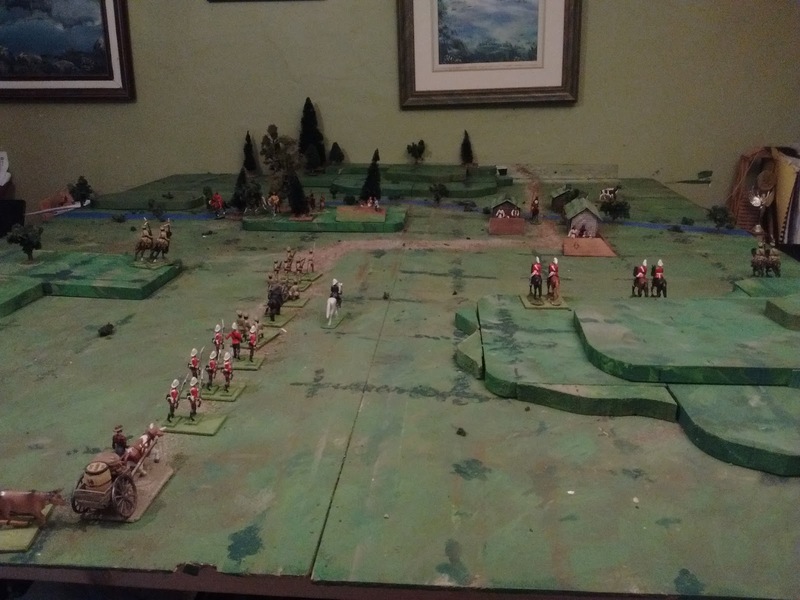 Having the mere idea of a punitive expedition as a start I made the scenario up as I laid out the terrain and sorted through what figures I had able to be used and pondered the back story which has changed a bit from what I was expecting last fall. At that time I was contemplating a sort of Not Quite the Boer War crossed with a bit of WWI in Africa or European intervention. However, having thrown some red coats into the first scenario to make up numbers made me think earlier and I was later reminded about the whole Not Quite the NorthWest Rebellion thing that also tempts me. I decided that I did not want to do both, certainly not at the same time nor did I want to make either campaign wait any longer. As an historical and military event the Boer War interests me but from a wargaming point of view its not recreating the history that is what engages me it is the switch from crowded battlefields fought over by similar armies to one of open veldt (or prairie) with periodic towns, rivers, etc, and the idea of a mobile, largely non-professional, army with modern weapons taking on a professional one successfully. I consulted the geography and existing history of my imaginary land and came up with a modified back story and plan. The Rebels sprang an ambush with infantry and cavalry swarming the squadron of Larsen's Lancers which were scouting ahead. By dint of prodigious die rolling vs handfuls of 1s and 2s Larsen's survived. As they pulled back the MG opened up catching a group of spearmen in the open and decimating them with a roll of three 5's and 6's. Useful things machine guns! The Faraway force consisted of a single Brigade consisting of a Commander, 4 cavalry, 6 infantry, a mountain gun, an MG and 2 supply wagons. The wagons have no combat ability but count as units for army morale giving Faraway 14 units or being able to suffer 5 losses. Since there is only one brigade the army will be defeated once it is exhausted. Their enemy was divided into 2 brigades. The tribesmen (name needed) under Blue Jacket had 1 cavalry, 2 mounted rifles, 3 rifles and 2 spearmen for a total of 8 units, exhaust point of 3. Old Cords led 4 units of Oerberg Mounted Rifles and a light gun. or 5 units, exhaust point of 2. Faraway entered along the road making full infantry road speed while the cavalry scouted for ambushes. They triggered one but managed to do more harm than they took and the rebels were some what taken aback at the firepower of the machine gun. 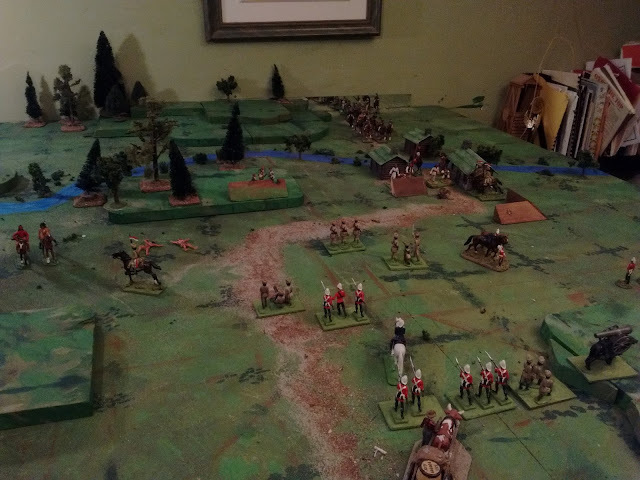 Their mounted troops spent most of the rest of the game trying to get at the wagons as the best way to cause the enemy to retreat. 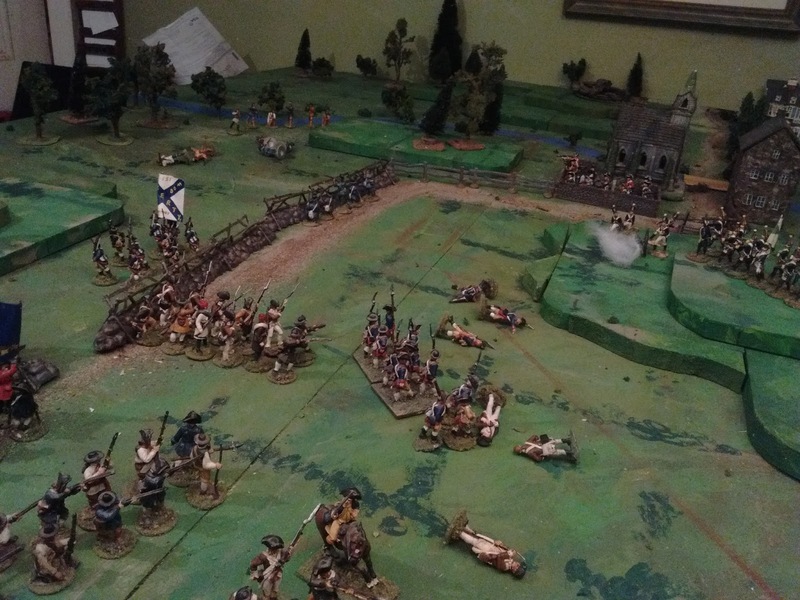 This had the side effect of drawing off 1/2 the Faraway troops to protect the wagons. The attack on the town looked promising at first. Against my better judgement I let a squadron of lancers charge the rifle pits while waiting for the infantry and gun to come up. 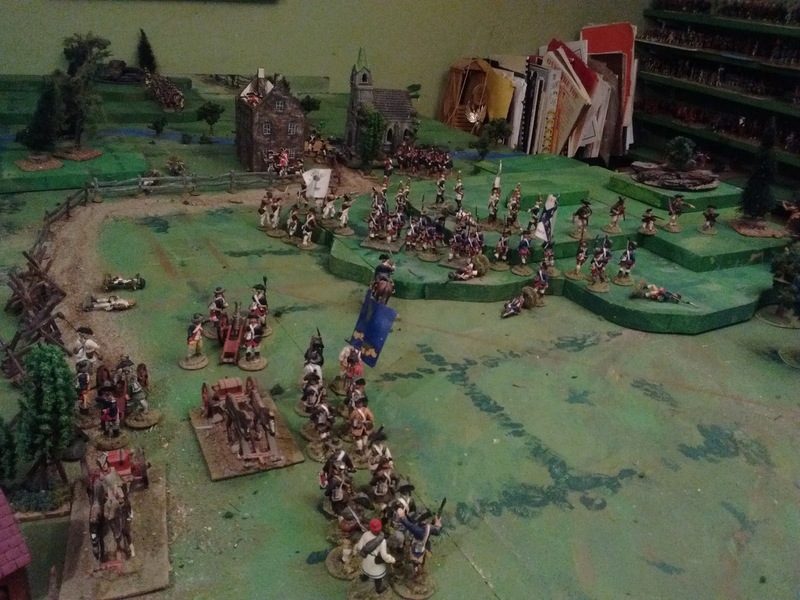 To my surprise they managed to drive the enemy out and lived to tell the tale and with the Dragoons coming up the scenario looked like it might have an early end. Then the Oerbergers showed up and a few turns later the town was cleared the Dragoons had lost a squadron and all of the Faraway cavalry was damaged. I pulled the cavalry back to rally and decided to try to wear the enemy down with long range fire. That wasn't going so well until Old Cords got cocky and sent one of his troops charging into the machine gun, forgetting that they were mounted rifles not cavalry and that the enemy was an mg until I rolled the dice. I offered to let him take the suicidal move back but he was too honest to accept and just pulled his unit off. That was when I decided I should count the troops and establish break points. Oerberg has lost 1 stand in the fight with the cavalry and this ill fated charge finished them off. It took a few more turns of manoeuvring and praying for initiative and some close calls which almost tipped the scales but at the end of the day firepower won out and Bluejacket's braves were forced to retreat. Faraway lost 2 cavalry and 1 infantry unit but won the day. What? The end? Sorry. The turns flew by so fast and I was so wrapped in the game that I forgot to stop for pictures. Incidentally, Although only the 6" squares are marked I was counting in 3" squares, or quadrants if you will. So, the rules? Well the fact that I was too wrapped in the game to take pictures probably sums it up well. There is nothing that I felt I would have to change but there were some last minute changes to the rules to simplify things that I think I will reverse not because they break the game but to improve the feel. The first is that originally a unit that gave ground was supposed to have to spent its next turn halted. That would have meant a marker, a different marker from the "I've suffered a loss" marker. Since a unit loses a die if it moved there is a penalty for retaking the ground but there is no penalty for cavalry falling back and immediately charging again and nothing to stop a unit of riflemen from being driven out of cover only to reoccupy it before the enemy could advance. Time and time again. I'll restore the pin marker and penalty but make the retreat part optional for troops in cover to save wear and tear on my fingers and to avoid having to explain why they would run away rather than hide. The second is that I abandoned my usual defensive fire rule for melee. The defender rolls first rule does the same thing for infantry and artillery but doesn't feel right for cavalry that is counter-charging. I'll just do the words once I figure out how to handle the give ground issue for simultaneous combat, maybe disallowing it for cavalry vs cavalry melees or making the defender choose first to reflect the advantage for cavalry of being the attacker in contemporary kriegspiel rules. One other thing I'm contemplating, not because it doesn't work but just to be tidy is to change the cover penalty from a score to hit to a die reduction. It makes a difference but I haven't decided yet if the difference is good, bad or neutral. Being consistent would be good though and easier to remember in the heat of battle as long as it doesn't harm the effect. Cumulative penalties for different things which might turn things from difficult to impossible is the real danger hence my occasional hedging of a "but never less than 1" sort of rule. Old Cords interferes in the Kapelle. War looms in the North! Early report has been received of an unexpected action in the Kapelle District. In response to attacks on Her Majesty's surveying parties while carrying out their official duties, Colonel Marten was dispatched with a column of troops to being the rebels to justice. Upon approaching the village reported to be harbouring the culprits, our soldiers were met not only by armed rebels but by an armed column of Oerbergers led by Old Cords himself. 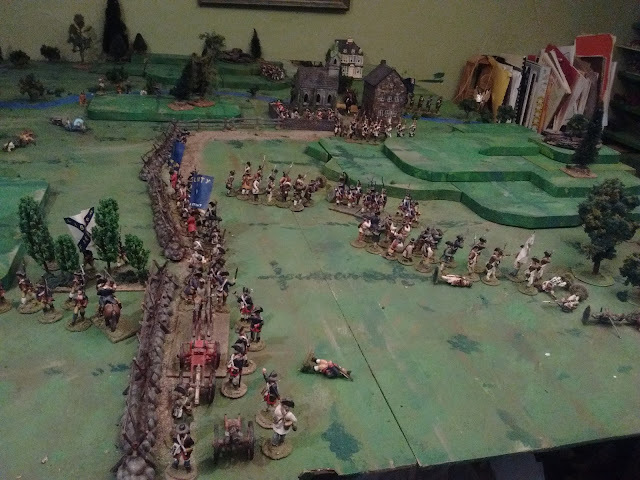 After spirited engagement the Oerburgers were sent packing and the rebels punished. Her Majesty's representative reports that the entire incident was resolved in most satisfactory manner in every sense but that war is sure to follow if Oerberg refuses to disown the act and surrender Old Cords for justice. Her Majesty's forces on the march to bring rebel marauders to justice. More details will follow when available. The Kapelle Field Force marches again. I know, its silly, but I'm all excited, like a kid at Christmas, getting ready for this test game tomorrow. In the frontier town of Klarksville, the Kapelle Field Force, minus detachments in garrison and on the train, is drawn up for inspection. Behind them the armoured train is about to leave on its last patrol. Any correspondents who wish to accompany the train should be there by 4:30. May be played on grid or measure using base width or agreed upon "units"
Units take 2 hits and occupy 1 area except artillery occupy 2 adjacent units, 1 for the gun, 1 for train. Once a unit takes a 2nd hit it is assumed to be exhausted or routed etc and is removed from the board. Sequence of play: Roll for initiative with winner choosing 1st or 2nd move that turn. +1 if aided by observation balloon or other advantage as per scenario. -2 If General lost. Chance Cards. (Optional) Make up custom deck or use playing cards. Assign red to 1 side, black to the other. Cards apply to that player. Only face cards and Aces are effective, others are no effect. Decide maximum number of turns to play and pull that many cards for a game deck. When the deck has been played the game is over. If joker appears roll d6 and discard that number of cards from the deck. At the start of each turn pull 1 card before rolling for initiative. King. Roll d6 and that many units may add 1 to move this turn even if attacking. Queen. Roll d6 and your enemy may choose that many units that must remain halted this turn. Ace. A unit of unexpected reinforcements arrive or 1 destroyed unit is rallied and may be returned to service. Terrain Max 1 unless native infantry. Some may be impassible to some troop types. Road +1 to move but no shoot or attack. If there is a unit immediately behind target reroll misses vs second unit. Melee. May not move adjacent unless attacking or ambushed. Must resolve melee if adjacent during melee phase. If adjacent to multiple enemy must split dice with a minimum of 1 against each enemy. If the number of enemies exceed the number of dice extra dice are granted to meet the minimum. 3 dice per unit in melee +1 die for each adjacent supporting unit able to shoot with clear line of fire to enemy and not itself in melee. mtd cav attacking in open. (ie not being attacked) or if Elite troops -1 die if inferior troops. Defender rolls first and attacker may give ground ow attacker then rolls and defender may give ground. If defender gives ground mounted cavalry may pursue 1 area and roll again. Give Ground. Each time a unit takes hits from one enemy unit, either shooting or melee, it may cancel 1 of the hits by retreating 1 area. A unit may give ground each time it is fired on by a different unit but only once in melee. Brigade Morale. A Brigade consists of a Commander 3 to 12 units. when 1/3 of the units are lost the Brigade is exhausted and may not shoot or attack but may defend itself in melee. Army Morale. When all of the Brigades in an army are exhausted it must cede the battle and retire from the field. The Other Half of that Disturbing New Thought. Yes there were two related but distinct parts to that earlier thought, I just didn't want to confuse things. Its those damned bases again. After that refreshing, modified Morschauser game, I realized that not only am I tired of my massed single figure experiments, something that was considered pretty well obsolete in many circles by the time I started wargaming in the 70's but which just had to be tried, but I have discovered that I have been harbouring a nostalgic longing for my 1 stand is a unit V&B days. This actually fits well with my slow absorption of comments from Jerry and Norm (see vive-la-difference.html) over letting unit commanders handle the details. On Monday I set out to play a Square Brigadier game but was interrupted and ended up playing a turn or 2 per day with various experimental versions so no battle report. However, it did give me a chance to think about last year's Nine Year's War games using the then Square Brigadier that worked so well and managed that "don't fret about the internal unit details" thing well while producing good games. For some reason the 4 figure units that filled a square just made it easier because they couldn't do a credible variety of formations any way and the presence or absence of bases was irrelevant. The same was true of the early WW1 games last year. Mounting my 40's on 4x2 man bases to get back to 4 "strength points" sort of did the same thing but the temptation remained to fiddle and fuss about formations and so on. Gratuitous picture because I love it! A Square Brigadier game in progress. If I was using the 20's as my main thing, this wouldn't be a concern as they and the terrain both fit the 3" squares well meaning there is room for lots of both on the main table. That would be smart but I'm not going there. There seemed to be 2 solutions: use 3" squares with a unit in each and allow terrain to span multiple squares or allow multiple units in a square, something I've tried a couple of times in a couple of ways but stumbled over trying to keep the units straight and on wording the rules so they could be applied in a consistent manner. With another fantasy game last weekend using a 1 stand of 40mm troops is a unit but without the grid, I started thinking and experimenting. Would it work? Could it help? What size base would look like a unit and work with my buildings? And my train? (gotta fit the train on the grid and the troops in the train or its a deal breaker!). After much experimentation, a 60x40 stand will hold 4x40mm infantry inc mg's and look big enough to look like a 'company' to me at least. 4 of these can then make a battalion as envisaged last fall. 60x60 will fit a gun and crew or 3 cavalry. 4 such infantry bases will fill a 6" square or 2 cavalry/artillery which is what I was experimenting with last fall and getting units mixed. That would allow games ranging from a skirmish between a few companies to battles between brigade sized forces with 2 dozen up to 3 dozen. Excellent! But can I handle that many? I have been working towards reducing the number of units figuring that it would make the game faster and make each unit more important to the player thus hopefully increasing his engagement with their fate. The Morschauser games with as many as 35 units on a table were faster and more furious with if anything more engagement since no one was ever really safe and generalship seems even more important, reserves must be in the right place at the right time and a player always ready for the unexpected, even without any sort of activation mechanism. 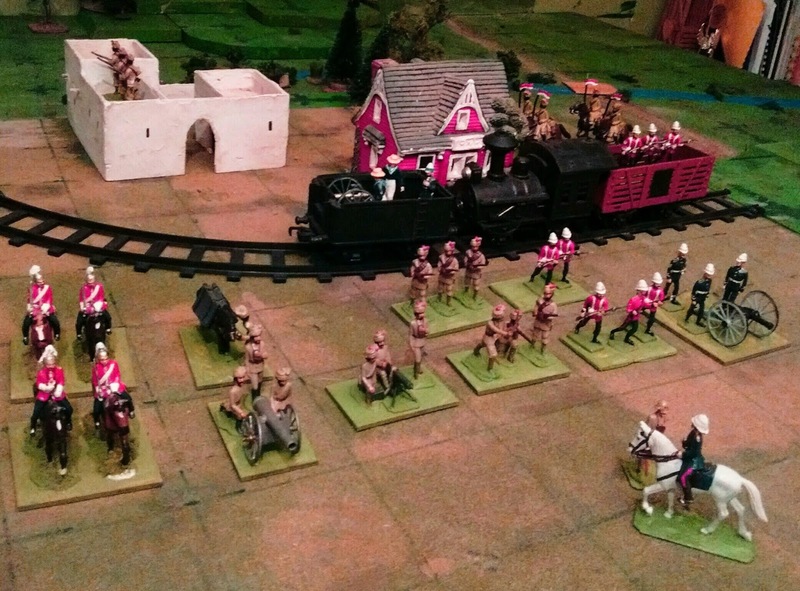 Last weekend's game with units being treated as 4x2 infantry or 3x2 cavalry. (Oberhilse actually being based that way) If you check the hill you can see that 1 cavalry unit was wiped out in its first charge while the 2nd had 1 stand left after pursuit combat. It was about 10 turns with much shooting and a few charges before another unit was lost though! I started to think about old alternatives such as 1 hit per unit but with a disorder result possible and and about those Morchauser games where there is no CC and units die like flies but the games are fast, fun and require generalship to win. I hit the archives so to speak and have spent a lot of time today in 2011 on my blog and on Bob Cordery's Portable Wargame site. My conclusion is Yes! it can work. Hopefully a rules summary post tomorrow and a game on Sunday. One down side to cramming too many games into an extended weekend is that I don't have time to write battle reports when the memories are fresh and I'm still excited. The American advance guards were ambushed and suffered heavily. The main body has now arrived and is forming to assault the hill. For this game I used the alternate dicing for initiative system which I prefer when there is a General with a plan commanding and as far as possible controling each side. I also upped the units to 12 men each for the infantry, 8 for the lights. The British had 2 Elite, 2 regular, 2 light and 2 gun. The Americans had 4 line, 4 militia, 2 guns and 2 rifle units. The attack has been repulsed leaving the American line in considerable disarray as more troops continue to arrive. I also made a small rule change. Instead of units that move only being able to return fire or to fire if charged, I let them fire after all units have moved or fired but before melee. The game rolled along nicely with some ebb and flow and some tight moments where a successful Ametican charge might easily have turned the tide. 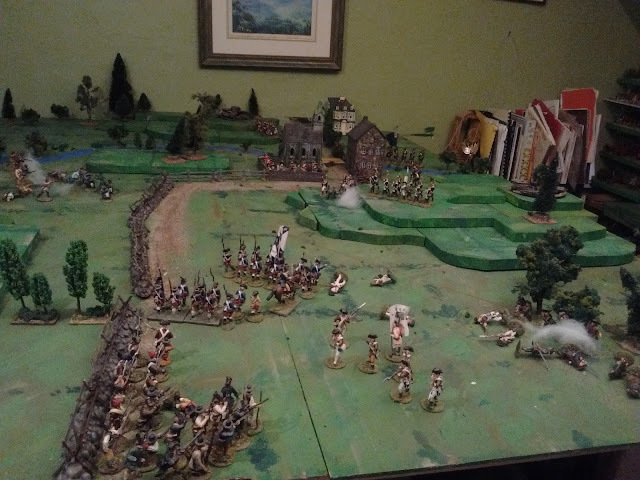 As the Americans form for a 2nd assault, the Hessians fall back. I enjoyed the game enough to start thinking about what I needed to fill out the armies. That gave me pause. I have a limited appetite for skirmishes but I would need to double the number of figures for a battle scenario and really it wouldn't give me anything gaming wise that I couldn't get from my NQSYW collection. Since I don't have a deep interest in the AWI, the only real reason for me to keep them is for convention or local group games but that's good enough for now. When I've managed to sell or place most of my surplus figures, then I can revisit. Meanwhile, I'll paint up a few figures from my AWI lead molehill and restore them to their old 20 figure organization, (close enough for Charge! ), and add a PA Hessian regiment which can take part in either war. 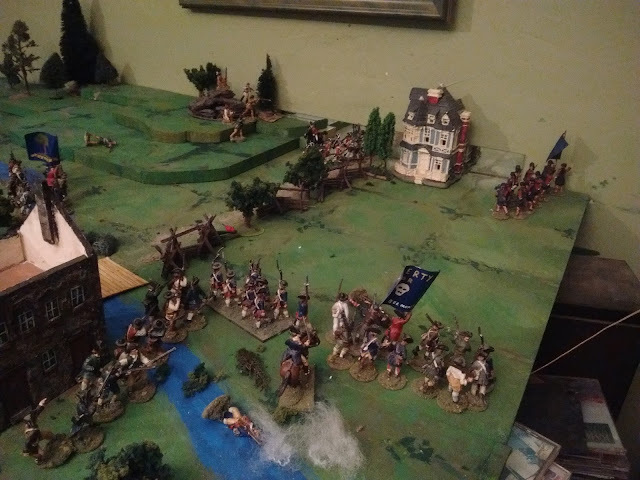 After engaging in several brief long range musket duels the British commander takes advantage of an initiative flip double move to break contact just before reaching their maximum allowed losses. The impartial GM awards them the victory for an appreciable delay with acceptable losses. In the meantime, I've finally gotten back to the Square Brigadier but more on that in a few days. MacDuff shakes himself off and does battle. The scenario I chose to play this weekend was number 4 from Programmed Scenarios. It wasn't actually because I just played and lost a Memoir44 version at Ron's on Wednesday, but because I wanted some sort of holding game but not one I have fielded a lot and I'm not sure I've ever hosted this one myself. Actually there are quite a few of the Programmed Scenarios that I'm not very familiar with. Something to look forward to over the next year I think. I felt a bit lost as I set up the AWI game on Friday though and it showed. I chose the wrong rules options and made some poor choices on converting the scenario forces to what troops I have. The resulting game was OK, barely not not satisfying. Rather than fret about it right away, I cleared the table and set up the planned Gathering of Hosts game (which I played most happily yesterday) and let my brain work on the problem in background mode. Today's forecast sun turned to rain and I had had time to consider things so I reset the table and played again with different rules options and a different Order of Battle. To my great relief the result was a fun, engaging game that whisked along to a nail biter ending. But that's for later. I'll just say a few words about the rules and the choices I made and append the Quick Reference Sheet to this post although it is also available as a download . Game 1: 8 man companies of Continentals deploy and advance against the Hessians. When I wrote the original rules they were designed for companies grouped into battalions for bigger games. In some ways it worked and in some ways it was always a pain since sometime this group was a unit and sometimes this larger group was a unit and it easily got confusing. Eventually I found that life was easier and the game played better if game units were game units and I started using 8 man companies for petit guerre scenarios and 16 to 20 man battalions for larger actions. I have been reading up a bit on the AWI in Nova Scotia over the last year and while there are some interesting little engagements they are all very (Very) small. With that in mind I decided to use 8 man units and a nominal scale of 1:5. I also decided to use the deck of cards sequencing which was really designed for those ambush in the forest type of games, not for a straight forward assault. The resulting game didn't flow well, especially when playing both sides, the units were too small and fragile and the card deck was too small. In short the game was just OK, barely. Somehow I had managed to forget that our War of Acadian Independence was based on the completely non-serious premise that Congress had sent the troops that invaded Quebec in 1775 and 1776 to Nova Scotia instead leading to campaigns involving several thousand troops on either side. So today, I reset the board with 12 man battalions and played using the initiative system. The result was a very traditional OS feel game which kept me on the edge the whole way through. Whew! In truth the current (final?? maybe??) version has as much Rattle of Dice and Hearts of Tin in it as it does MacDuff but MacDuff has seniority and the intent on the sort of game is the same so I'm sticking with him! I'm 90% sure that these are the rules that the boys in havelocks will be marching to when their time comes. I think this might be the end of the game. Might have been a draw as in enemy delayed at too high a cost or maybe it was a victory. Oh well. SEQUENCE of PLAY. Roll for initiative each turn, winner chooses to go 1st or 2nd with all units. Once all units on both sides have acted resolve any end of move shooting then resolve all melees. Alt sequence. If agreed players may use a deck of cards instead of rolling for initiative. Assign red to 1 side black to the other. When a player’s colour is drawn he may activate 1 commander or unit. This is especially relevant for small skirmishes or games set at night, in fog, forest. In multiplayer games allow each player on a side to activate 1 unit. Once all units on both sides have acted resolve any end of move shooting then resolve all melees. MOVEMENT. Player must declare move before rolling. A unit may advance at full speed or retire full speed backs to the enemy. It may also move backwards or sideways at 1/2 speed. Wheels are made on a stationary pivot. Charges. Enemy must be visible to front before moving. A unit is pinned if contacted by a charge except that cavalry which has not yet moved may counter charge and skirmishers that have not yet moved may retreat. Terrain: Roads negate terrain. Visibility in woods etc 3”. Broken Ground. Irregulars and skirmishers move full, formed reg infantry, cav ½ move. SHOOTING. Once per turn. Shoot instead of move or at end of turn. Effect: 5 or 6 = hit. 1/2 dice long range, +1 to die if sharpshooter or regular 1st fire or if shooting at column of flank. -1 if inferior. Troops in cover and skirmishers suffer ½ hits. Round ½ up if partial cover, round down in full cover. MELEE: 1d6 /2 infantry or gunners or 1 cavalry. Count 2 ranks in line. 1 rank if others or if attacked in flank or rear. Effect. Each modified score of 5 or 6 inflicts 1 hit on the target. Troop Quality +1 If Elite or Shock Troops, -1 if Militia or not equipped for melee. Result. Unit taking more than inflicted test morale. 4,5,6 Steady. if lost melee fall back in good order, if disordered, rally. 1,2,3 Retreat full move in disorder facing enemy. DISORDER. Count ½ when shooting and in melee, may only shoot as a reaction. They must spend a move halted to recover. RALLY MEN! A Commander may move up to 12” to join a unit which has lost a casualty to shooting or which is in melee. He must stay with the unit till the en of the turn. Roll 1 die 1 d6 4,5,6 =1 hit cancelled, 1 = Cdr ko. FOLLOW ME! A commander may join a unit and add 1d6" of movement but must stay with the unit till the end of the turn. This coming weekend is a bit of a reprieve for me. Home alone with rain in the forecast and just the critters to look after. I hope to get at least 2 games in. Guided by my determination that it is time to clear out some of the physical as well as mental and emotional clutter I am going to challenge my 40mm AWI troops by putting them on the table. For some time I have been a little perturbed at myself for having AWI as well as 1812 collections (we won't even go into having had AWI figures in 2, 3 ok 4, different scales and 1812 in 2). From a tabletop wargaming POV the Northern AWI and War of 1812 provide very similar games in different uniforms and without the tiny handful of cavalry. There are a few sieges, a couple of small open battles most of which would have made better wargames if there had been just a few tweaks, and lots of raids, ambushes and assorted nastiness. I had been leaning towards focussing on the War of 1812 (better battles) but while both wars saw action in my home province of Quebec, the War of 1812 largely passed Nova Scotia by. Sure there was some privateering and the largely unopposed occupation of parts of northern Maine but it wasn't like the Revolution when there was an actual rebellion here with a siege of Fort Cumberland and privateer raids on coastal towns as well as action of the seas and the more actively opposed Fort George affair in Maine not to mention that there had been some support for having Montgomery and Arnold attack Nova Scotia rather than Quebec. 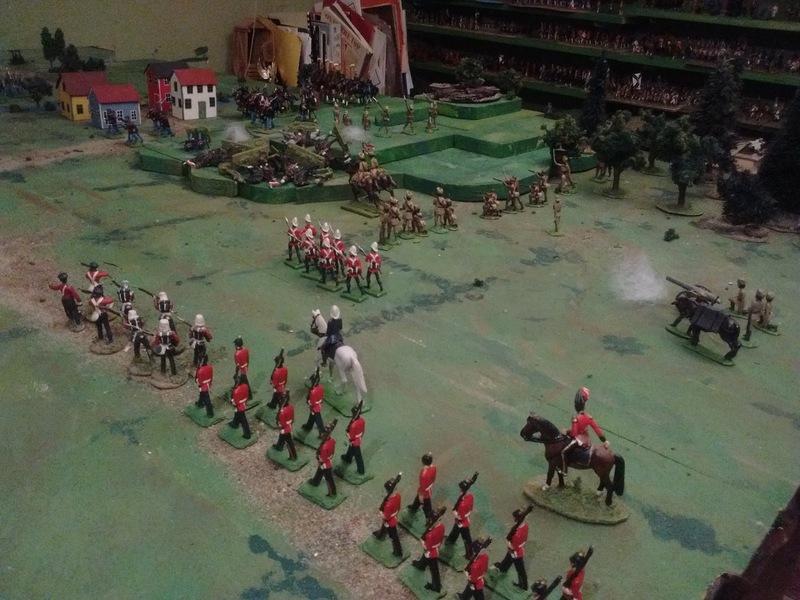 The fact that I have friends here with 40mm AWI and Rob has F&IW figures, some of which can work along side mine and vice versa while my 1812 figures are on their own is a key factor in my favouring the AWI again. This wouldn't mean the elimination of my 1812 collection but a return to the idea of a small 40mm 1812 "game in a box", probably portable game style, with the rest of the figures being sold or repurposed. 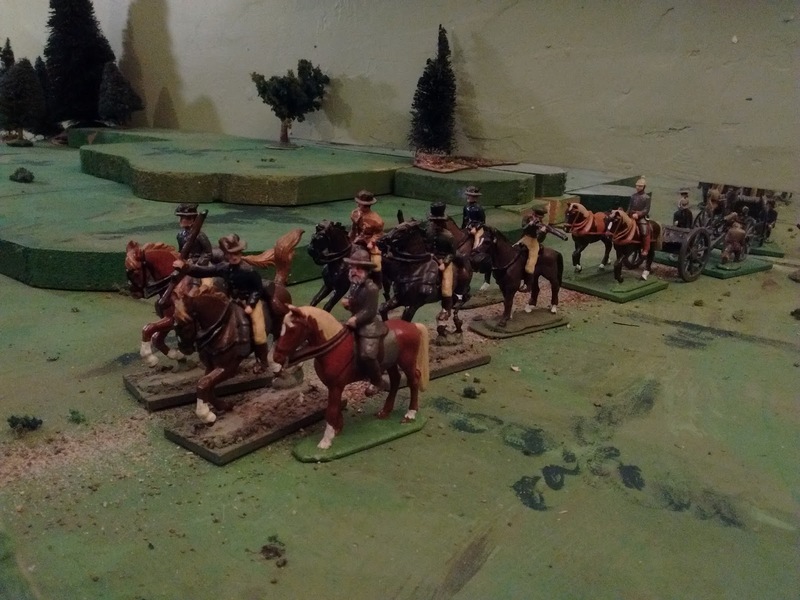 Another, minor, factor is that it finally gives me a use for some of the new PA molds, the Prussians can be Hessians. They aren't what everyone would consider compatible style wise but close enough for me. 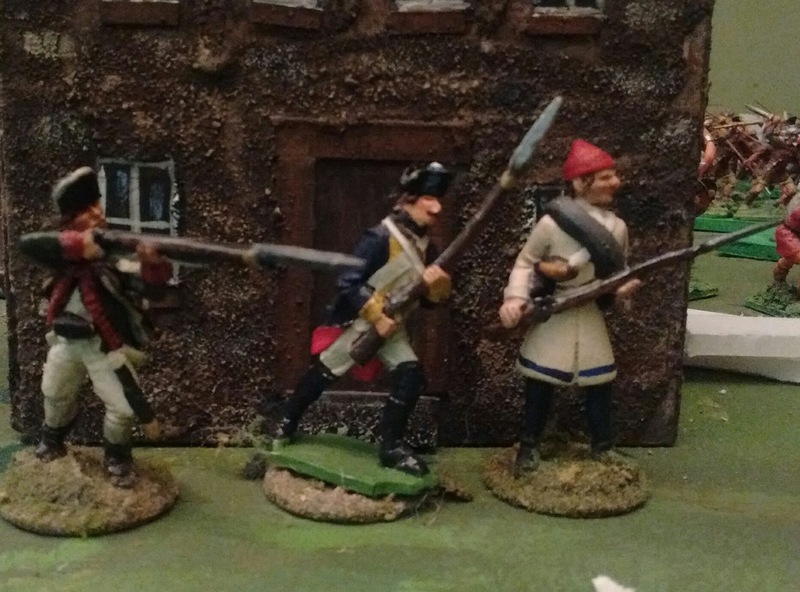 40mm Sash & Saber, Prince August and Irregular miniatures. So, one of the weekend games is set to be an AWI game, a low level action using an updated MacDuff (Quick Reference available here, main rules not updated till I'm happy with some games) I'll also post it here on the blog with notes before the game. The other will be a test game for the 40mm Gathering of Hosts. Its not going as smoothly as I thought. For one thing I have been reminded of the extreme size and style variation in the figures and have been trouble in my mind making everything fit together with the background. I've also rediscovered that I had more figures in waiting than I remembered and the project threatens to grow out of control without a firm hand. So a focus for 4 Kingdoms with slightly earlier troops and Elastolin/Miller/Perry/Prince August/Irregular sized figures. The Empire will keep the Meisterzinn sized, puffy Landsknecht style guys but will probable only appear rarely and in small numbers as the table will be soon be full without them! This means that if the test is successful, both the 16th Century and Prince Valiant figures and games will be moving to the Gathering of Hosts blog. Uhoh! A disturbing New Thought, best go lie down. 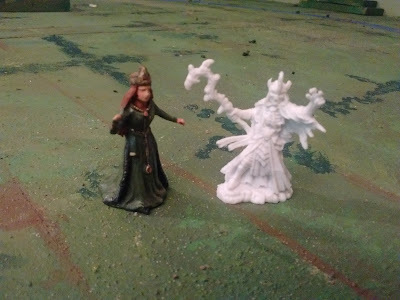 The problem really is those twin miniature wargaming demons: a sentimental attachment to favorite old figures and a desire to do at least a little of everything. The symptoms are that my room is overflowing with figures that get used too rarely, I don't get to play enough games of anything to really get a handle on rules etc or to make progress on playing campaigns and I end up painting figures I need for a game rather than figures I just want to paint. Most suggested solutions for this sort of problem tend to involve horrific things like discipline, self denial and so on that just lessen one's options and the variety of games that can be played. The other day a thought came to me, a drastic, horrible, thought that might ease the pressure a bit while still allowing me to do all the things I want. It does eventually involve the horrible, nasty business of letting go of "things" though so there is still hope that the solution will fail. 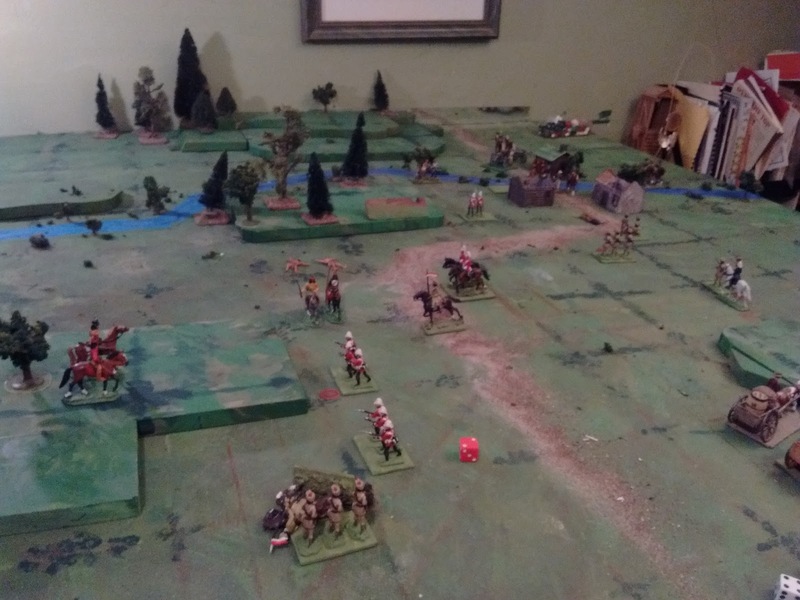 It started with a tabletop battle last month which appeared on my Gathering of Hosts blog and involved my 40mm 16thC Anglo Scots armies and a set of fantasy battle rules, which Rob Dean and I am working on, based on Morschasuer's Shock Era rules. I was reminded how much I love these armies, which include not only a handful of toy knights which I first played with 50 years ago but also my first units of original figures. I was also reminded how rarely they see the table top these days. 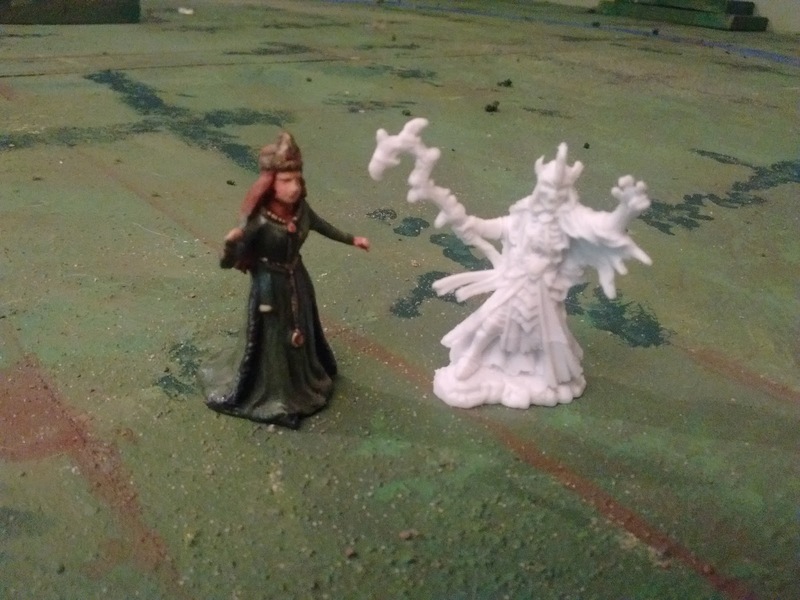 After Huzzah my brain received some more material when I discovered that some Reaper Bones fantasy figures that I got from Rob were a better fit for my 40mm Elastolin Prince Valiant figures than for my OS 25mm armies. The Elastolins are another favorite collection that rarely gets out. A Merten 40mm court lady and a Reaper 28mm something nasty. On Saturday morning as I was painting some 40mm Centaurs for a Prince Valiant game I found myself thinking that my 25mm fantasy campaign could easily be fought out with 40mm figures replacing my 25 ones. This would allow me to essentially replace my 25mm fantasy campaign, 40mm Prince Valiant games and my Rough Wooing 16th games with a single 40mm fantasy project using the revived Valdurian setting from the 25's and the 40mm figures. Elastolin Vikings looking as fantasy-ish as you please pretending to be a leader and 2 elements of Warband for a Comitatus game a few years ago. Since I have never really established exactly where Prince Michael's adventures take place they can easily be fitted into the northwest of the Midlands. They can be joined by various knights, pikemen and archers to defend the Midlands. The Turks and other Easterners that I have been wanting to paint for ages, along with various monsters, would become the troops of the Great King. The Picts, Highlanders, Centaurs and the like become the Men of the West while my almost unused Prince August Viking & Saxon moulds along with Elastolin Vikings, Normans and Huns become the Northern Confederation leaving the Landsknechts and puffier English to defend the Empire. Since the new rules combine "1 standard base is a unit" troops along with individual characters, I can even retain the capability to have some Prince Michael adventures that don't include battles. Its perfect! Scots using the Rough Wooing rules, also derived from Morschauser and meant for battles, while escorting a civilian convoy past some English Border Horse in 2009. Well, except the bit about what happens to my old and "new" OS 25's? Well, for now, they are hurting no one and can stay on the shelf. I can even paint some up when and if I get the urge but after the initial rush of nostalgic excitement, I'm finding that I just don't enjoy painting the 25's as much as I used to. To finish the project I need to paint a few hundred more 25's and I especially don't enjoy painting masses of 25's as much as doing a few 40's. Times and I have changed. However, an idea is not proven by thought and it will take some games at various levels, using temporary bases for the Prince Valiant figures before I make any big decisions on this one. I fought the game and the..